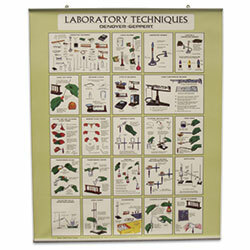 Hang these charts on your wall for a constant reminder of safe laboratory conduct. They feature 23 brightly-colored panels, each illustrating a key laboratory procedure. Laboratory safety charts show significant safety practices, examples of how to correctly use safety equipment, and cautions against improper techniques. Laboratory techniques charts show procedures in a step-by-step fashion, with easy-to-read captions - it’s like having a full-time refresher course right in your lab. Both charts are printed on tear-proof synthetic stock with stiffening rods at top and bottom. Eyelets allow easy hanging. Charts measure 36"W x 44"H.